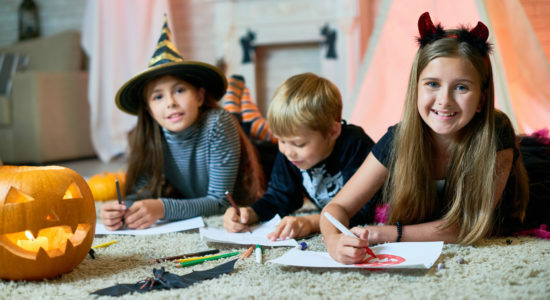 What Causes Spooky Reappearing Carpet Stains? Halloween is here—which means the leaves are falling, everything is pumpkin-flavored, and you’re almost ready to bust out your costume. There are many fun, festive, spooky things about this season. There’s also another spooky mystery you may have noticed in your home: reappearing carpet stains. Firstly, have you ever wondered why carpet stains and odors reappear—even after steam cleaning? Today we’re letting you in on a little secret: what makes carpet stains reappear, and how you can scare them away for good. If a carpet stain seems to mysteriously reappear, chances are it’s actually a new stain that forms on residue left behind from soapy solutions used by steam cleaners. Most importantly, if you rented a machine to clean the carpet yourself—or if you hired a professional that uses steam cleaners—chances are an extremely soapy detergent was used to treat stains and soiling. The problem with soapy solutions used by steam cleaners is that often the soap isn’t rinsed off of your carpet fibers effectively—leaving behind a sticky, oily film that attracts dirt. This actually leaves you with carpets that are more vulnerable to stains than before. Solution: Not to worry, you don’t have to be stuck with sticky carpet residue! Chem-Dry has developed a greener, more effective way to clean your carpet. Our Hot Carbonating Extraction method utilizes the power of tiny carbonating bubbles to lift stains to the surface. And the best part? Our non-toxic, green cleaning solution won’t harm your family or pets or leave residue on your carpet fibers. Here’s the thing about carpet stains: they rarely just stay on the surface. In fact, they often soak deep into carpet backing and even carpet padding. These stains combined with the excess amount of moisture steam cleaners use (and don’t extract all the way) remains stuck deep within your carpet backing. When the carpet finally starts to dry, this stain/soap mixture travels up the carpet fiber and “reappears” repeatedly over time. The bottom line: when too much water is used in the carpet cleaning process, you’ll have to deal with “wicking”—or reappearing stains. Solution: The full-proof way to avoid wicking is by choosing a carpet cleaning method that uses less water. That’s where Chem-Dry comes in. Our Hot Carbonating Extraction technology uses an astounding 80% less water than traditional steam cleaners. It’s a no-brainer, right? Professional carpet cleaning from Chem-Dry can eliminate most odors, allergens, and bacteria. However, carpet odors from pets are a little trickier. Just like with stains, pet urine penetrates beyond carpet fibers to backing and padding underneath. But the problem is, when the moisture dries, potent odor crystals are trapped deep beneath your carpet. Therefore, while professional carpet cleaning can remove stains, these smelly crystals remain intact and will continue releasing odor in your home unless treated with a special pet urine and odor removal solution. Solution: Chem-Dry has you covered! Our Pet Urine Removal Treatment (P.U.R.T.) contains powerful components that chemically (and safely) break down these strong odor crystals. And the benefits don’t stop there—our process also removes 99.9% of odors and 99.2% of bacteria from pet urine in carpet! Scare Away Carpet Stains And Odors For Good! Above all, it’s possible to have a cleaner, healthier home with carpets that are stain, allergen, and bacteria free. With the help of American Chem-Dry’s Hot Carbonating Extraction carpet cleaning and Pet Urine Removal Treatment, stains and odors can become ghosts of the past! « Facebook: Give Us A Like On Social Media!